This was our first view of Tbilisi. Narikala Fortress looms over our hostel (right behind the 12th century Armenian Cathedral of St. George in this picture) and the Old Town. This is the second of four vignettes from the 40th anniversary trip Margaret and I took to Armenia, Georgia, Malta and England earlier this fall. 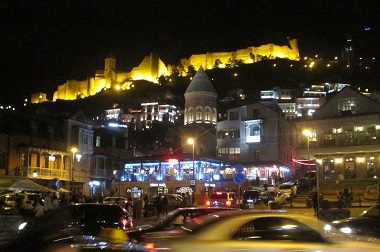 Arriving in Tbilisi, Georgia at night was a magical experience. We were dropped off in the Old Town, by the Mtkvari River Bridge. The skyline above us as we climbed the steep hill leading to our Envoy Hostel was dominated by the Narikala Fortress. After settling in, we gazed from the rooftop patio, which commands a tremendous view of the city. The steep river bank was lit up with ever-changing lights. On the cliff sits the striking Metekhi Church (built in the 13th century as a copy of an earlier church destroyed by the Mongols), which is accompanied by an equestrian statue of 6th century King Vakhtang Gorgasali. Across the valley is the giant newly-built Tsminda Sameba Cathedral – symbol of the Georgian Orthodox Church’s post-Soviet revival – bathed in golden light. The only thing partially blocking our view was the 12th century Armenian Cathedral of St. George. 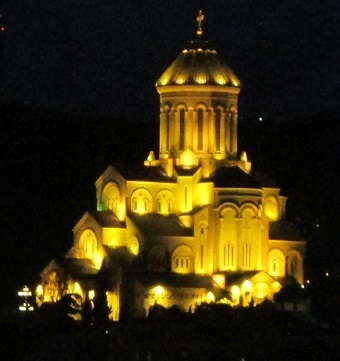 We had a tremendous view of Tsminda Sameba Cathedral from our hostel. We haven’t run into many people from North America who have been to Georgia, but it is now attracting lots of tourists from Europe and Russia. For many years they stayed away, during the years of Soviet rule, and the years of Russian-backed secession movements in Abkhazia and Ossetia (with fighting as late as 2008) on the nation’s northern borders. There is plenty to see – ancient church complexes (Georgia’s Orthodox Church is one of the oldest in the world, and is still central in people’s sense of nationhood) usually juxtaposed with gorgeous mountain vistas. But I will focus this article on three experiences which relate to personal contacts and interests. Bart and Michelle Byl outside Tbilisi International Christian Fellowship. Bart hails from Metro Vancouver. We participated in nine Christian services during our trip – apart from numerous visits to Orthodox and Catholic churches. We particularly enjoyed our visit to Tbilisi International Christian Fellowship, a lively multicultural congregation which meets in a fairly nondescript building some way out of the centre of the city. 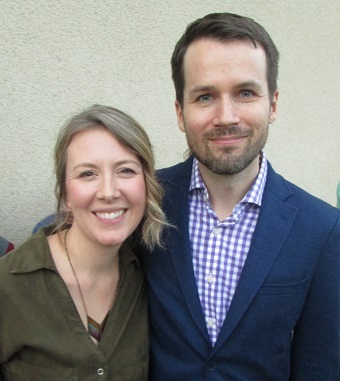 We were more than surprised to find that the young man being installed as pastor of the church that Sunday morning is a Vancouver native. Bart Byl has been working in Georgia since 2016, when he moved to Tbilisi with his wife Michelle and their two children. He is a digital publishing entrepreneur who is doing graduate studies in theology online with Vancouver’s Regent College. A particularly delightful aspect of the service came during the introduction of guests. There were about 10 young Indians who grew up in various Gulf states and are now studying at Tbilisi State Medical University. They had been brought to church by more senior Indian medical students, some of whom were on the worship team. Let’s hope some of them end up in Vancouver to practice medicine!. 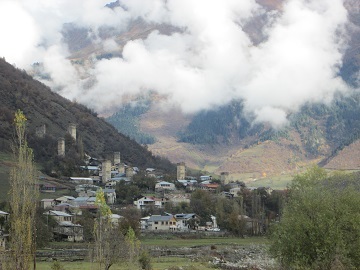 Stone towers dot the landscape around Mestia in Svaneti. Svaneti is one of the most beautiful areas of Georgia. Nestled in the Caucasus Mountains along the Russian border, it has always been a remote and quiet part of the nation. When Georgia was threatened by invasions, treasures were sent to the mountains for safekeeping. Some of them are still at the impressive local museum – and, apparently, in some local homes. Dozens of centuries-old stone towers built to protect villagers during invasions and the blood feuds which were apparently common until fairly recently still dot the landscape. 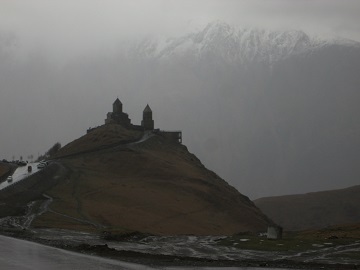 Svaneti is still isolated, especially in the winter, when snow blankets the villages and makes travel difficult. Beautiful mountains vistas – and particularly the unparalleled opportunities for hiking and skiing – are drawing more visitors every year. The main town, Mestia, is being reimagined as a a Swiss village (which Margaret and I particularly enjoyed, given that we first met at L’Abri in the Swiss Alps). 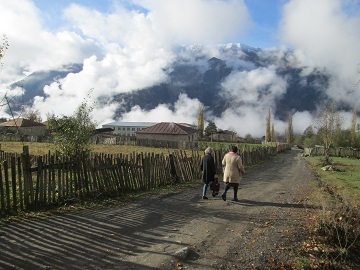 Friends in Vancouver had told us about an intrepid couple who have made their home in Svaneti. We experienced their hospitality at the Hanmer Guest House, which is up a steep unpaved road in Etseri, some 22 kilometres short of Mestia. 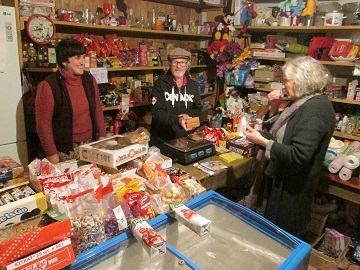 Lali and Tony Hanmer with Margaret in their store, on the first floor of their guest house. Tony Hanmer has moved around a bit in his life – born in England, he lived in Canada, Zimbabwe and Russia before moving to Georgia some 18 years ago. His wife Lali grew up in eastern Georgia, close to Azerbaijan. They married in 2006 and have been in Etseri for the past six years. The guest house is just one of several things the active couple are involved in. Tony writes a column for a Georgian publication and teaches in various locations. Lali teaches English to all 75 students (grades 1 – 12) at the school just a stone’s throw from their house. Then she attends to the store on their main floor – which they point out is the largest store for 20 or 30 kilometres in either direction. Her joy and main winter activity is translating Christian books into Georgian. The Hanmers host and participate in Christian events in their community. Although not many locals are committed to Protestant-style Christianity, there are informal church gatherings in the area. Large groups of children take part in singing, skits and crafts at their home. Margaret and Lali walking from the Hanmer Guest House to the school. Tony and Lali faced some opposition from Orthodox Christians when they first moved into their house, but that has abated. They note that the local Orthodox priest is quite friendly, in part because he also is something of an outsider. The Hanmers are fine with people remaining in the Orthodox Church (that is, not joining them), and concentrate on providing spiritual and practical support. Lali says many locals still hold traditional views and are not particularly receptive to church activities of any stripe. We were very fortunate to miss snow, visiting as we did in late October. Heavy snowfalls are common in Svaneti and the Hanmers have to lay in large quantities of basic supplies before the winter. Two giant barrels of cheese stood in the corner of the kitchen. The farmers make it, and sometimes trade it – along with potatoes and other produce – for their store goods. Tony and Lali have worked diligently in their village for years, and plan to continue. But they would love to have supported workers join them, either short-term or long-term. Lali’s particular concern is for elderly women who have fallen between the cracks; with the dissolution of the Soviet Union, pensions are woefully inadequate. The Salvation Army drum corps performing in the centre of Tbilisi. We had just emerged from the subway onto Rustaveli Avenue in central Tbilisi when we heard drums and saw a crowd gathered in Liberty Square. It turned out to be the Salvation Army, celebrating 25 years in Georgia – and the final granting of official status. Drum corps members seemed upbeat, and that was confirmed by Magna Våje Nielsen, Territorial President for Women’s Ministries (the Salvation Army East Europe Territory covers Georgia, Romania, Ukraine and Moldova), who said that young Salvationists in Georgia are particularly enthusiastic about the faith. One group sang ‘Shine Jesus Shine,’ in Georgian of course. Territorial officer Magna Våje Nielsen with Margaret. 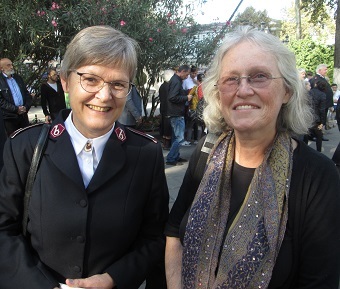 One Salvationist officer told us that Orthodox Christians have not always been receptive to the Salvation Army, and said priests have sometimes even threatened to curse the families of young people who join the church. Leaving the site, we accepted a bookmark from a young pony-tailed man on the outskirts of the crowd: It had a big STOP sign with the Salvation Army logo in the ‘O.’ We feared it was a protest, but upon having it translated, discovered it was aimed at stopping human trafficking, which we had learned, before going to Georgia, is becoming a problem in Tbilisi. Very good to see the Salvation Army tackling it. The 14th century Tsminda Sameba Church is on the Georgian Military Highway, surrounded by mountains, close to the Russian border. Mtskheta has been considered Georgia’s spiritual heartland ever since the nation adopted Christianity in 327. Less than an hour north of Tbilisi by bus, it features many impressive sites. The most significant is Jvari Church, perched on a hilltop with a breathtaking view of Mtshketa. The day we drove north along the Georgian Military Highway – the ancient route through the high Caucasus Mountains to southern Russia – we spent a bracing hour at the remote Tsminda Sameba Church, surrounded by snow covered peaks hidden, mostly, by threatening clouds. Beautiful and impressive in any weather. ← What would Jesus think of our criminal justice system and why should you care?